A Government of India report has ranked Ahmedabad 43rd in its cleanliness survey of 53 districts it has selected for the purpose. Worse, Ahmedabad, which is desperately seeking world heritage tag from UNESCO, ranks poorer than all but one of the 13 districts chosen from Gujarat out of 53. With a score of 71.6 out of 100, the survey finds Ahmedabad, the business capital of Gujarat, and sought to be projected as a model for urban India, performing worse than the tribal districts of Tapi and Narmada, with a score of 74.9 and 78 respectively. Only one district, Panchmahal, ranks worse than Ahmedabad, with a score of 64.1. The best score in Gujarat is that of state capital Gandhinagar, 82.9. 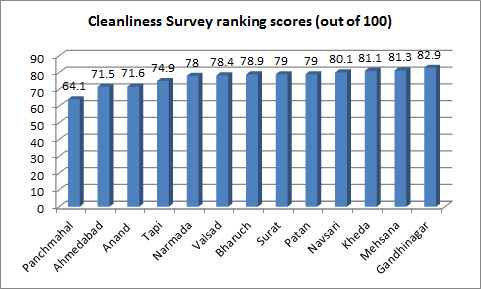 However, the survey finds Gandhinagar to rank 18th of the 53 districts surveyed. The best performer in India is Sindhudurg district of Maharashtra, with a score of 96.8. Next is Nadia district of West Bengal with a score of 96.8, followed by Satara district of Maharashtra with a score of 92.9 per cent. Key parameters with weightage for the survey are: Percentage of households having access to Safe toilets and using them: 40; percentage of households having no litter around: 30; average score of cleanliness (out of 100) around public places: 20; and percentage of households having no wastewater around: 10. 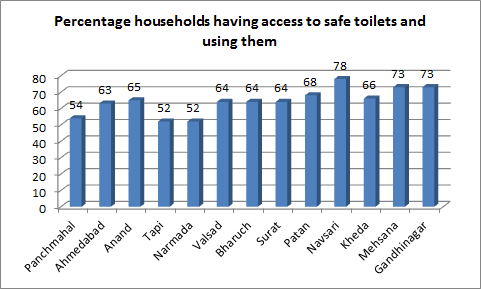 If the survey is any indication, just about 63 per cent of Ahmedabad households have safe toilets and are using them. This is against 99 per cent in the best-performing district of Sindhudurg Maharashtra, followed by Nadia in West Bengal 97 per cent, and Satara in Maharashtra 96 per cent. Several of Gujarat districts, in fact, perform better than Gujarat in having household toilets – Anand 65 per cent, Bharuch and Surat both 64 per cent, Kheda 66 per cent, Patan 68 per cent, Navsari 78 per cent, Gandhinagar and Mehsana 73 per cent each. In the three other parameters used for the survey -- percentage of households having no litter around, average score of cleanliness (out of 100) around public places, and percentage of households having no wastewater around: 10 – Ahmedabad, interestingly, performs even worse. Based on National Sample Survey (NSS) data collected last year, the report find that while 55.5 per cent of Gujarat’s households have sanitary households, in all, 96.2 per cent of the population either uses household or community toilets for defecation. Titled “Swacch Survekshan” (Cleanliness Survey), the report was released by the Government of India’s Ministry of Drinking Water and Sanitation on September 10. 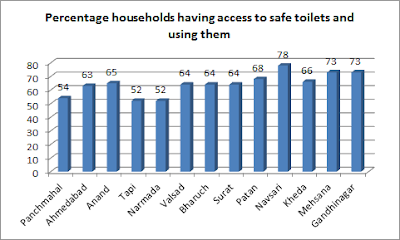 As already reported variously, the report ranks Gujarat 14th in the number households using sanitary toilets in India. Sikkim ranks No 1, followed by Kerala. Both have 98.2 per cent and 97.6 per cent households using sanitary toilets. Providing its “ranking methodology”, the report says, the “process and outcome indicators of the survey were conceived by the Ministry of Drinking Water and Sanitation, in association with the Quality Council of India” with the involvement of “150 assessors”, who were deployed to visit rural areas in 75 districts and collect sanitation related data. “A special mobile based application was created for the collection of data. This application was installed on handheld tablets which were used to ensure that information collected was consistent by validating through geo-tagged pictures”, the report says.